Fat Talk Free Week Video — Be sure to check out this video! We’ve all heard, and probably have said, comments similar to these. Although we may not always be aware of it, these types of comments constantly chip away at our body confidence levels. Currently in the US, there are more women who are diagnosed with eating disorders than there are with breast cancer. Eating disorders are life-threatening illnesses that arise from the desire to be thin. There is nothing wrong with wanting to be healthy, but there is a vital difference between a healthy lifestyle and a lifestyle focused around being skinny. It’s been said before, but it’s worth repeating; “healthy” looks different on everyone. There is no standard size for healthy. How can we reverse this frightening increase of eating disorders? Partly by creating a positive environment that fosters love for our bodies. 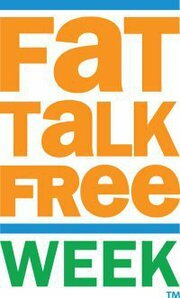 This week is Fat Talk Free Week across the country. 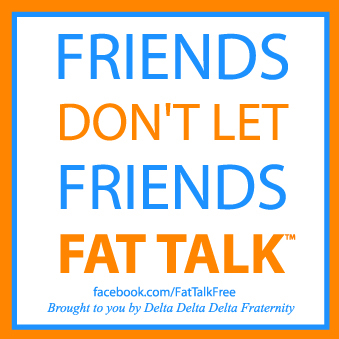 Every year, Tri Delta sororities at hundreds of college campuses host Fat Talk Free Week, spreading the message of how negative comments about a person’s weight can have harmful, sometimes life-altering, effects on an individual. For more information check out their website here. Monday, 10/17= Through the Looking Glass: Come join us in the GSU for the first event of Fat Talk Free Week! Take a look in the mirror and write down one thing (or more!) that you like about what you see. We’ll hang it up to help encourage others to see the beauty in their reflections. Tuesday,10/18 = Inspiration Station: Think of a person you admire and think about why you admire them. Do they stand up for what they believe in? Are they patient and kind? Write it down on a piece of paper and staple it to others’ responses. Together they form a chain of positivity. Wednesday 10/19 = Body Appreciation: Take a look at our life-size body tracing and think about what each body part helps to accomplish each day. Instead of looking at size, appreciate what your body does for you. Write down on the trace-out what is amazing about each body part to help inspire others. Thursday, 10/20 = Share The Love: Come to our table and write down one thing you love about your body. Help others to think positively about themselves. Let the good vibes flow! Friday, 10/21 = Through The Looking Glass, Part 2: If you missed it the first time, come to the GSU and find something you love about what you see in the mirror. If you were at the event on Monday, think about whether your thoughts have changed after a week of positive self-talk. Find something new about your reflection to love! Saturday, 10/22 = FREE Strengthening Class at FitRec: Come to Room MU4 at Boston University’s Fitness and Recreation Center from 9 – 10 am for an interactive class focusing on a mixture of cardio, strength, and stretching. Learn how these three components can each have a different impact on your body. All ability levels welcome! Also, throughout the entire week the Sargent Choice Nutrition Center will be holding a clothing drive! This drive encourages everyone to donate those clothes that don’t fit anymore and may make you feel negatively about your body. Donations benefit Rosie’s Place, a sanctuary for poor and homeless women. Donations boxes are placed at West Campus, Warren Towers, Myles, Shelton, Towers, and the South Campus Lounge. We will also have a donation box set up at the GSU from 11:30-2 every day next week. Go to school somewhere other than BU? 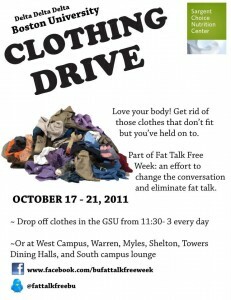 We’d love to hear what your campus is doing for Fat Talk Free Week! Send us a comment or post a picture on our Facebook page! 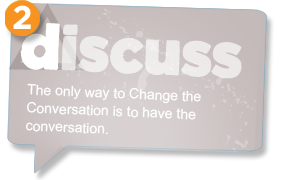 Why is Fat Talk Free Week important to you? What do you think is the most effective way to get the message out? We’d love to hear your comments! I think it’s very true that the way we speak about others and especially our own ‘self talk’ deeply impacts the way we feel and behave.